Organic oils and herbs are infused and blended with local beeswax and organic essential oils to create these soothing salves. These salves come in 30g (1oz) glass jars. Arthritis 911 Cayenne infused oils blend with Black Pepper, Marjoram, Frankincense, and Rosemary Essential Oils speed relief to aching joints. Black Drawing Salve is a blend of Comfrey, Calendula, and Plantain infused oils with local Honey, Kaolin Clay, and Activated Charcoal. It has historically been used to draw infections or splinters to the surface of the skin. 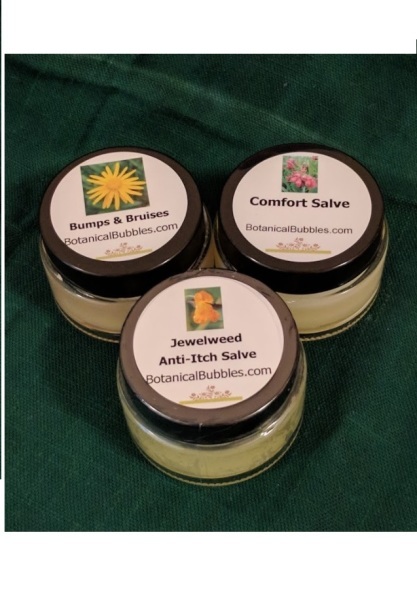 Bumps and Bruises Salve Arnica and Goldenrod to help ease the ache. Comfrey is added to promote healing. Calm Balm has a blend of Essential Oils purported to help reduce stress. Rub on the soles of your feet or the inside of your elbows or wrists for quick absorption. Comfort Salve combines Comfrey, Calendula, Lavender, Lemon Balm, Chickweed, and Plantain for a salve that is sure to bring comfort to cuts and scrapes. Fire & Ice Salve warming Habanero infused Hemp Oil and cooling Wintergreen Essential Oil combine with St. John's Wort, Arnica and Ginger infusions and Peppermint Essential oil and Menthol Crystals to speed relief from soreness. Germ Be Gone has a combination of Essential Oils to give your immune system a boost. Rub on the soles of your feet or the inside of your elbows or on your neck for quick absorption. Good Night, Sleep Tight Cinnamon, Ginger, Peppermint, Grapefruit, and Lemon Essential Oils are blended with Scullcap infused oil to help calm adrenal gland production and allow you to fall asleep naturally. Happy Hands (Happy Feet) a warming salve to help promote circulation in fingers and toes. Lavender soothes the sting of minor burns, like wind burn or chapped cheeks. It is combined with Calendula, which is healing for skin. Menthol Rub Rosemary, Peppermint, and Lemon Balm infused oils combined with Beeswax and Eucalyptus, Peppermint, and Lemon Essential OIls. Rub on chest and soles of feet to ease congestion. No More Itch Jewelweed and Plantain combine in this salve. Both are anecdotally used to treat itchy skin from bug bites to poison ivy. Stop Menstrual Pain (SMP) has a blend of Essential Oils including Lavender, Marjoram, Ginger, Rose Geranium, Clary Sage, and Ylang Ylang to help reduce stress. Massage onto abdomen or back to relieve pain. Sore Muscle Salve warming Cayenne and Yarrow infused oil with Essential Oils of Rosemary, Ginger, Marjoram, Wintergreen, and Black Pepper. New for winter! 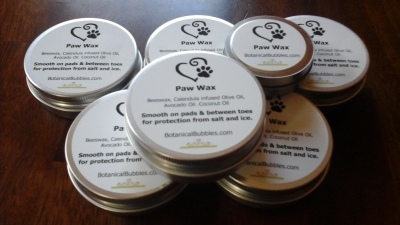 Protect your pooch's paw from the salt and ice with Paw Wax! Smooth on pads and between toes to keep out the harshness of winter. 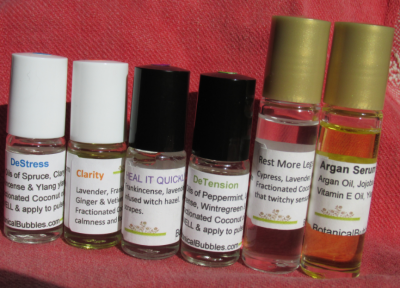 Pure Essential Oils are blended with a carrier oil and are available in convenient roller ball applicators. Apply to wrists, inside elbows, backs of knees, soles of feet, or where indicated. Clarity A blend of essential oils designed to help you focus on the task at hand. Great for students. ​Your favorite Botanical Bubbles Essential Oil scent combinations blended with Fractionated Coconut Oil. Apply with the convenient rollerball applicator. Choose from Lavender Patchouli, Lavender Lemon or Simply Lavender.